The City of La Quinta, California, and Coral Mountain Partners, LP, utilized local utility incentives and a virtual net metering program to lower energy costs for low-income residents, allowing LaSalle Solar Systems to expand plans of a 50kW solar system to 319kW. Since the start of construction, A.M. LaSalle Electric, Inc. was contracted to complete the project’s electrical system. LaSalle Solar Systems, a division of A.M. LaSalle Electric, Inc. and leading provider of commercial and residential energy services, was also contracted to install a small PV solar system on the roof of Coral Mountain Apartment’s clubhouse. Originally, the system was intended to offset the common load of the clubhouse, but with the help of the utility and the flexibility of Enphase technology, LaSalle set its sights on a much larger solar vision. 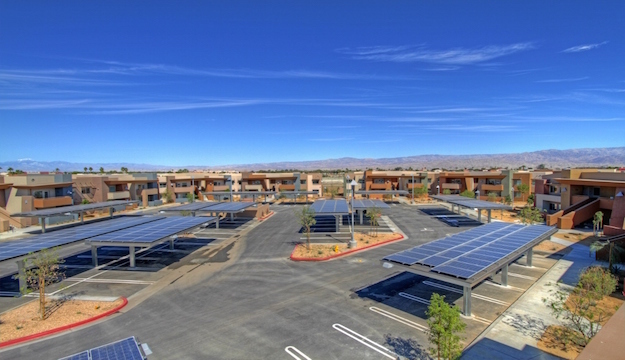 The goal was to help reduce the residents’ electrical bills through renewable energy, so LaSalle worked with their engineering and design team, Integrated Power, to present the property owner with a new solar plan—one that utilized additional building space and multiple carports. Expanding the system didn’t come without its challenges though, and the additional rooftops posed shading issues that only microinverters could manage. Because of parapet walls, HVAC systems, and mechanical systems already on the roof, LaSalle designed the PV system in 3D so it could customize the system to make the most of the roof’s available space. Even the orientation of the carports were a challenge, but again, Enphase Microinverters were the perfect fit. LaSalle and Coral Mountain Partners, LP, needed one single point of interconnection in order to utilize the utility’s newly implemented virtual net metering rule. With virtual net metering, Coral Mountain Partners, LP, could allocate part of the energy production to the building owner to cover the energy needed by common spaces, and divide the rest between the residents of each unit of the complex, to offset part of their electrical bill. As a result, Coral Mountains Apartments was the first virtual net metering project in Imperial Irrigation District, the area’s local utility. “Enphase Microinverters helped us organize a very complex installation without the extra confusion of string inverters,” said LaSalle. Coral Mountain Partners, LP, has two monitoring systems: revenue grade as the utility required, and Enphase Enlighten, which the owner depends on to easily pull up the system on the computer, mobile device, or tablet and get a good view of the system as a whole. Installer LaSalle Solar Systems, a division of A.M. LaSalle Electric, Inc.
"Enphase gave us a design flexibility that we couldn’t get using string inverters."